The new online exhibit is part of the Tennessee Virtual Archive (TeVA). It features 120 images and an interactive story map, tracking Brock’s progress from combat engineer training at Fort Leonard Wood, Missouri, to his time with the famed Second “Indianhead” Infantry Division in the vicinity of the Iron Triangle and the 38th parallel in Korea. Brock’s photos capture the heartbreak of leaving behind a sweetheart and the challenge of mastering military engineer techniques and infantry weaponry. The photos document the camaraderie of soldiers during the first American war with racially integrated units and their interactions with Republic of Korea soldiers in the squad tents of the Second Division. Brock’s pride in serving as a “tomahawk warrior” is evident in these photos as well. His unit built roads, bridges and bunkers near the front while often under enemy fire. As a demolitions specialist, Brock detonated explosives and laid and cleared mines. He also served as an infantry soldier when needed. 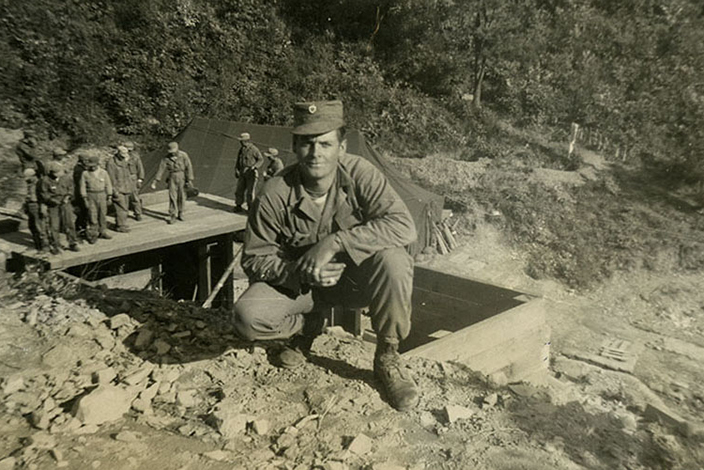 Also a part of this online collection is a transcript of an oral history recording Brock’s Korean War experiences that he contributed to the Library and Archives’ ongoing commemoration project “Tennessee Remembers,” which honors the men and women who served in Korea and Vietnam by preserving the history of their wartime experiences. The goal of this project is to collect original documents, photographs and memorabilia related to the in-country experiences of these veterans to be preserved for future generations and made accessible for research and educational purposes. As a part of “Tennessee Remembers,” the Library and Archives has developed questionnaires for Korean War and Vietnam War veterans that give them the opportunity to document and preserve their war experiences for future generations.